Minnesota Hillel : About Us : Parents : Welcome Parents! Minnesota Hillel is at the center of a vibrant Jewish community for over 1200 university-age Jews in the Twin Cities. We offer students at all Minnesota universities the opportunity to develop their own Jewish community with initiatives that are personally meaningful and life transforming. Through Hillel, your son or daughter will benefit from a range of opportunities geared towards helping them continue their Jewish journey into adulthood. 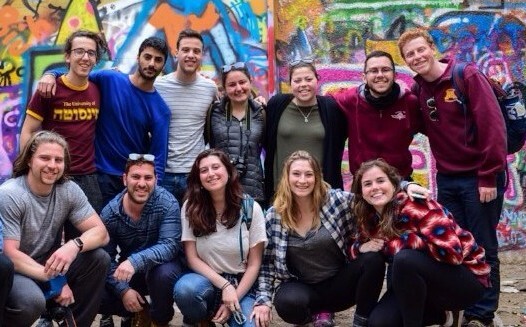 The talented Hillel staff cherishes the chance to work with each student and seeks to offer a host of meaningful entry points into Jewish campus life. Minnesota Hillel is here to provide your student with a solid and thriving Jewish community away from home. We look forward to meeting you on campus, whether it be during New Student Orientation, Move-in Weekend, Family Weekend, Commencement, or just because you are in the area! If you have any questions, please don’t hesitate to contact us.